(1)(Red), Discard a card at random: Pyromania deals 1 damage to target creature or player. 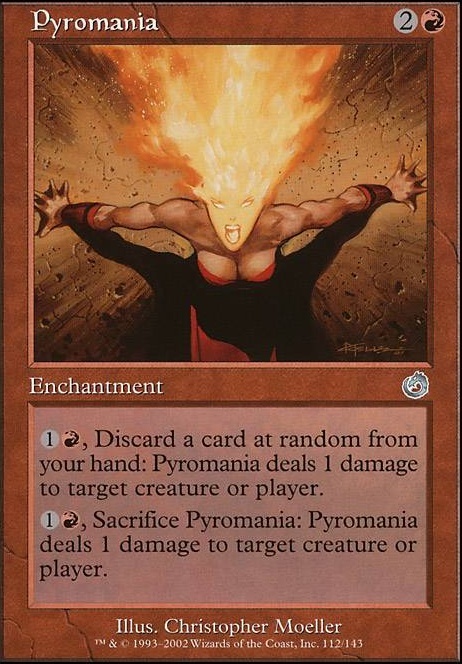 (1)(Red), Sacrifice Pyromania: Pyromania deals 1 damage to target creature or player. once you've built the deck on this site, you can post a link to it rather than typing out every card every time. heres an example. for your angel deck, i'd reduce the amount of super high mana cost cards, and increase the amount of lands to 24. the Armageddon isn't really ideal since you don't have any nonland ways of producing mana. for lands, you definitely need dual lands if you want to use cards with double white and/or triple red in their costs. Arid Mesa , Sacred Foundry , and Clifftop Retreat are the best ones in your colors. Pyromania and Cleansing Nova could be traded for Lightning Bolt and Path to Exile . I really like how Stranglehold hoses some mechanics that can be boring (and the fun flavor text exemplifying red's anti-intellectualism is a nice bonus). 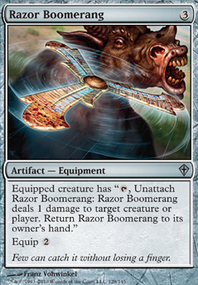 Because of this, I thought I'd brainstorm some cards in the same spirit by similarly hating on arguably cheesy stuff in Commander, e.g. staples, lockdown and various kinds of infinitive combos (while trying to avoid letting my cards enable such shenanigans themselves). Would appreciate feedback and other cards in a similar vein (maybe an Eminensce/Oloro interactor? 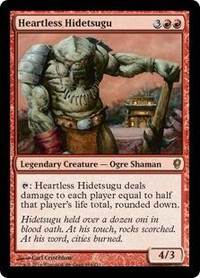 ), especially from actual cEDH people as I'm not too familiar with the cutthroat realm of 2-3 turn victories myself. Since I feel Stranglehold is too conservatively costed for a kinda niche card, so I might have gone overboard with my below creations by e.g. making them creatures and/or giving them too low CMC. Also, right now the hating is mostly done trough some sort of loss of life or downright prevention; suggestions on mixing things up a bit more would be particularly appreciated. You may cast this spell as though it had flash if you pay more to cast it. Whenever a spell or ability causes a nonland permanent to return to its owner's hand, Scorner of Cowardice deals 2 damage to the controller of that spell or ability. "The only reason to leave the battlefield is victory or oblivion." Comment: Meant to hate on Cyclonic Rift and e.g. Cloudstone Curio. The flash option is there to provide some risk for Rift in particular. The nonland clause is primarily meant to avoid causing unjustified collateral damage to Karoos and Moonfolk but I dunno if that leads to some infinitive combos slipping under the radar. Flavorwise it's meant to be a Nyx creature associated with Mogis or maybe Iroas/Purphoros. Spells and abilities can't cause permanents controlled by the controller of those spells and abilities to untap. Spells and abilities can't cause permanents not controlled by the controller of those spells and abilities to tap. "I will honor Zhalfir's memory with the blood of time mages." Comment: Provides an obstacle for e.g. Palinchron(Scorner of Cowardice doesn't really faze it currently) and Derevi, Empyrial Tactician. Flavor-wise, it's a Kwende knockoff (although this one isn't looking for Teferi specifically since he's widely believed to be dead). Was changed from white to red as it primarily hates on mechanics associated with blue (and to a lesser extent white due to the tapping). "For there to be order in a nation, all must follow the same clock." Whenever a spell or ability copies a spell or permanent, the controller of the first spell or ability loses 2 life. Comment: Meant to hate on Storm and e.g. Kiki-Jiki. The extort is there to make it less niche (also because it's funny). If a player would draw a card while their library has no cards in it, they do not win or lose and Pyromaniac deals 5 damage to that player instead. "If your head is empty, fill it with fire!" Comment: Obvious anti-Lab man (although I kinda feel obliged to reference Pyromania somehow). The wording feels overly specific since the "win" clause is currently only relevant when the card's opposite is involved. The hypothetical Hellbent ability is there to give it something to do outside of being a hater (and goes nicely with the flavor text), but I dunno what to put there. 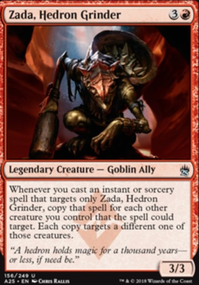 Could be some kind of bonus damage but it would have to be sufficiently distinct from Anthem of Rakdos, or add without being neither underwhelming nor abuseable. Whenever a spell or ability causes a card to be put from exile onto the battlefield, Aether Backlash deals 3 damage to the controller of that spell or ability. As Mishra's Isolator enters the battlefield, choose a zone other than the battlefield or the stack. Cards in the chosen zone loses all abilities. Comment: Following my own suggestion, this shuts down Oloro, Derevi's commander tax-defying shenanigans and the Eminence people. Other than that niche it can also be used to hose e.g. Anger and Cycling; I dunno if that makes it too unfun. I'm also a bit unsure how it works with casting-relevant stuff like Kicker. As Mishra's Revoker enters the battlefield, choose a card name. Cards with the chosen name loses all abilities unless they're on the stack or the battlefield. Comment: A less extreme alternative to the Isolator. 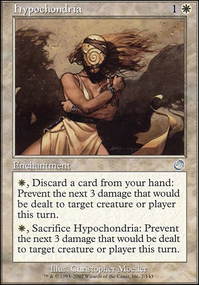 Mishra was influenced by OG Phyrexia, so it's not a stretch to think he'd make his own Revoker. All creatures lose all creature types. The same is true for creature spells and creature cards that aren’t on the battlefield. Comment: This one came up as a byproduct of me working on my Universal Tribal Supplements. It's mainly meant to hose the Eminence people since they all rely on tribal cards/permanents, although this might be a case of throwing out the baby with the bathwater. What do you think of Neheb, the Eternal ? 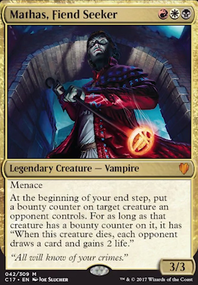 He gives you infinite attack phases with Aggravated Assault if you hit for 5 or more which is very easy, In a 4 player game, Pyromania for 5 makes enough mana to hardcast any eldrazi titan and Wheel of Fortune, maybe pay 5 into Pyromania , get 15 mana, hardcast Kozilek, Butcher of Truth, and Final Fortune to then swing with kozilek, and get infinite combat steps? Win? Sounds like a fun little deck. Pyrohemia is from Planar Chaos. Pyromania is from Torment. You have Pyromania in your sideboard. And it was even all foiled up. Ooh so purdy! 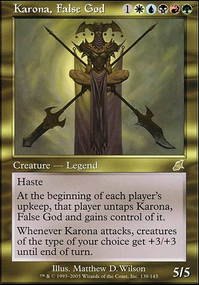 Best flavor text of the pack was probably the Pardic Lancer, though the calendar has had better.